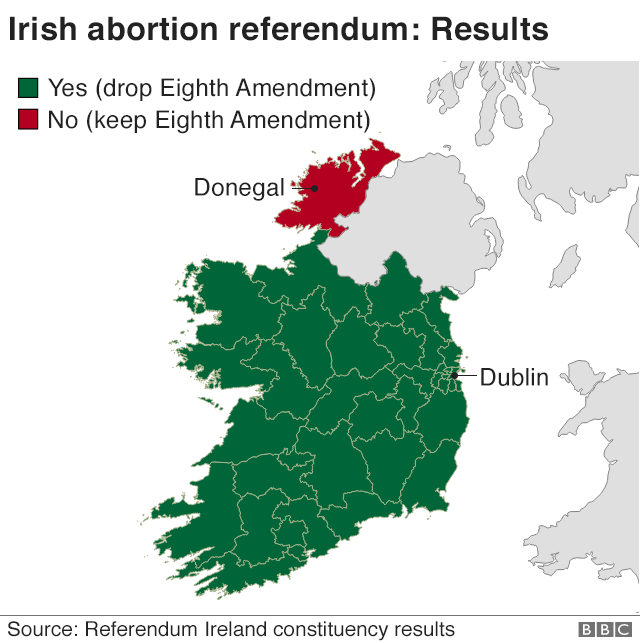 The Republic of Ireland has voted overwhelmingly to overturn the abortion ban by 66.4% to 33.6%.Ireland voted decisively to repeal one of the world’s more restrictive abortion bans, sweeping aside generations of conservative patriarchy and dealing the latest in a series of stinging rebukes to the Roman Catholic Church. Accordinly the Eighth Amendment, which grants an equal right to life to the mother and unborn, will be replaced.A vote in favour of repeal paves the way for the Dáil (Irish Parliament) to legislate for change which would see the introduction of a much more liberal regime. The eighth amendment is a clause inserted into the Irish constitution after a referendum in 1983. It recognises an equal right to life for both mother and unborn child, effectively prohibiting abortion in almost all cases. The proposed legislation will bring Ireland into line with the majority of European countries, allowing for abortion on request up to the 12th week of pregnancy (subject to medical regulation). After 12 weeks abortion would only be available in cases of fatal foetal anomaly, if the pregnant woman’s life was at risk or if her health was at risk of serious harm. Cases after 12 weeks would have to be approved by two doctors.